The Saladacco, or spiral slicer is a great cost effective tool I use often. Eating a whole foods based diet for fibro is easier with tools that support taste, texture and variety. No sharp edges like the razor board, everything is enclosed and easy to use. Either way we are creating variety and appeal. I dress the zucchini with various seasonings or dressings. My favorite includes ginger dressing and avocado. The variety is endless. Cost effective and very easy to use. A great addition to grain free eating anytime of the year. One of the only juicers that also properly extracts and juices wheatgrass. Make your own raw nut butters as well .. This juicer is also easy to use and clean. Excellent choice in juicers ... Refer to the Juicing/Blending page for suggestions, recipes and more !! 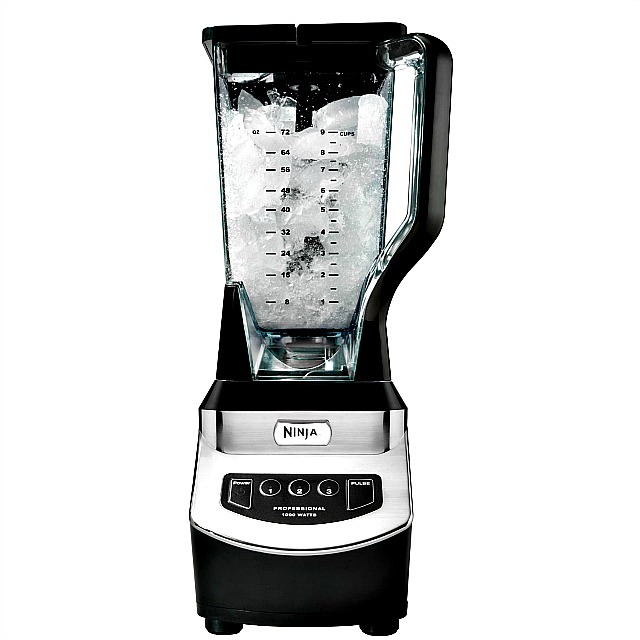 My favorite Blender..the Vitamix 5200 is a worthy investment in your fibro health. I've had mine for over 14 years now (the same one) and with a great warranty and quality high powered blender, its a great tool for improving assimilation of essential nutrients by breaking down the whole food components. Creating endless variety, from drinks to soups to sauces made at home with safe ingredients. If price is an issue with a vitamix, the next best rated blender would be the Ninja blender (either the Ninja Professional NJ600 or the Ninja Master Prep Professional QB1004) BPA free and uses good quality blades ..
My favorite food dehydrator, Excalibur, shown on left and shown in use on right. 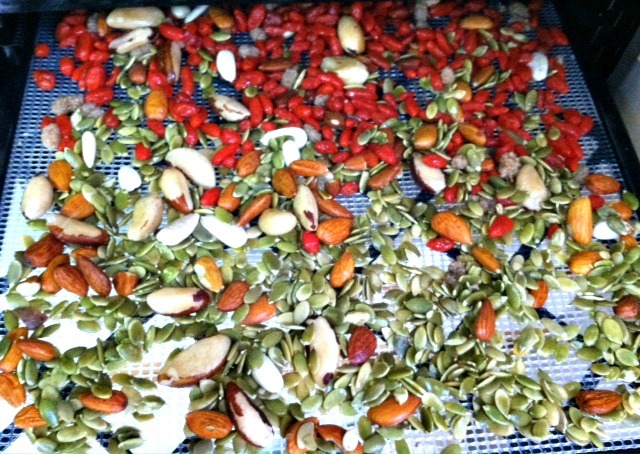 This is an example of how we soak and then dehydrate nuts, seeds and berries, for optimal digestion and removal of enzyme inhibitors..
A dehydrator is a great way to keep foods in their raw, healing form. Enzymes are kept intact and we can create a variety of healthy foods in our own kitchen, from kale chips to grain free cookies. 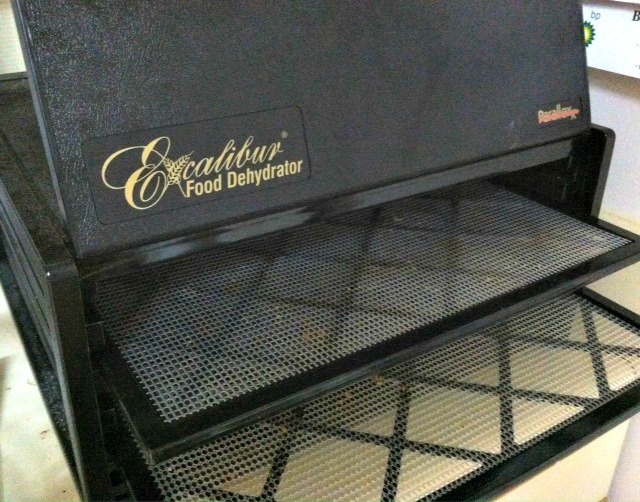 Although dehydrators are great for dehydrating fruit, I don't recommend relying on too much fruit sugar. This applies to both kids and fibro bodies alike. Kids can adapt to less overall sugars in their diet when a variety of healthy foods are introduced (but not forced) at a young age. With fibromyalgia, we are best to follow a low sugar, low grain diet. The best way to clean juicer parts. After almost 25 years of juicing, I also want it to be as easy as possible, but when people often say they avoid juicing because they don't like cleaning the juicer? No way, just like with anything, the MORE we do it, the easier it becomes even for fibro people. Essential for sprouting non grains, acceptable legumes like mung beans AND even sprouting grain for cultured drinks such as rejuvelac. Vision glass pots are safe and excellent cookware for all types of baking in oven and on stove top. They distribute heat evenly and are a safe alternative to metal or other questionable materials. 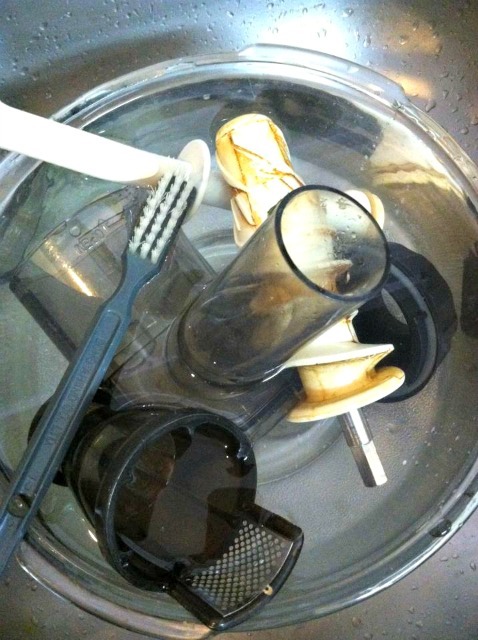 Beware of dishes that are not up to standard as they can break or crack during cooking. I have found many of my vision pots and dishes at estate and yard sales. Use this donut pan for appropriate recipes on Fibro-Girl's Gluten-Free Recipes Page.